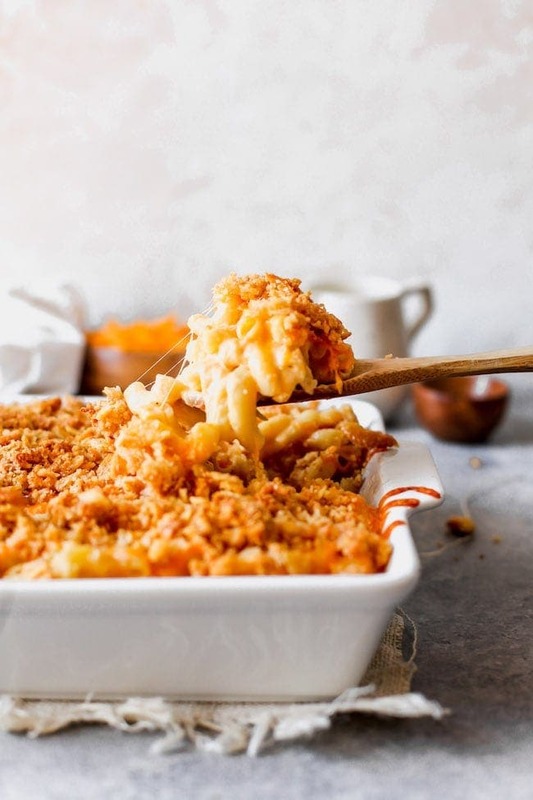 This family favorite Baked Mac and Cheese is creamy, cheesy, and finished with a buttery panko cracker Parmesan topping. Serve as a main dish or side dish, it is the BEST homemade mac and cheese Recipe! You guys all know my dad makes the BEST cinnamon rolls. If you don’t know, you have to try his cinnamon rolls ASAP. Well, my dad also makes the BEST Baked Mac and Cheese. Yep, it’s true! His mac and cheese is hands down the best, everyone loves it and always requests Parry’s mac and cheese! 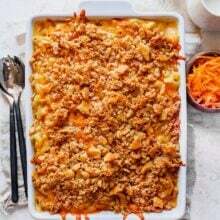 My dad made this mac and cheese all of the time for my siblings and me, it was one of our favorite meals. You can’t go wrong with homemade baked mac and cheese, especially when you are a kid, and especially when it’s LOADED with cheese. My dad doesn’t hold back on the cheese, he goes all out! 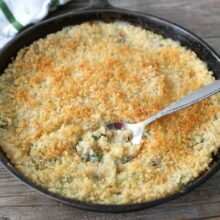 His baked mac and cheese is rich, creamy, CHEESY, and has a buttery panko cracker topping that seals the deal on this being the BEST mac and cheese recipe ever! Trust me! Homemade mac and cheese is the way to go. I know the simplicity of the blue box can be tempting, but I promise this homemade baked mac and cheese isn’t hard to make and it’s SO much better. The extra effort is worth it and it makes a BIG pan so you can enjoy leftovers or share with family and friends. Once you make homemade mac and cheese, you won’t be able to go back to the box stuff. 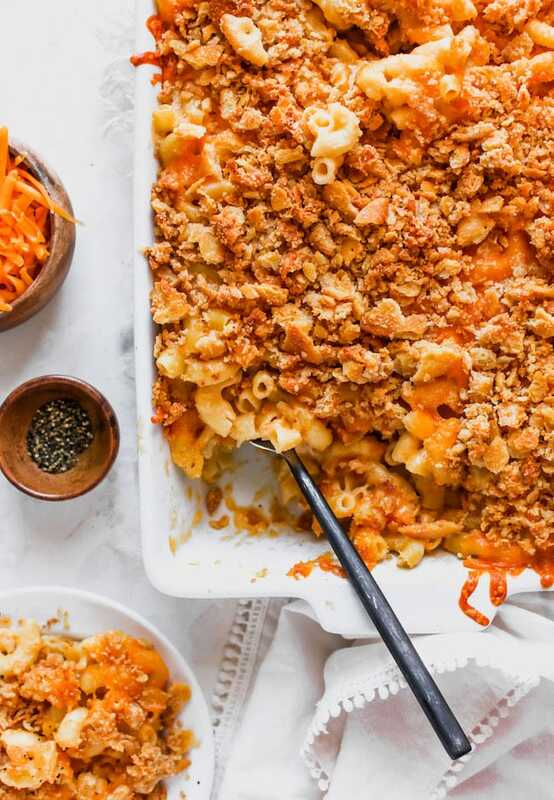 This baked mac and cheese is the real deal! 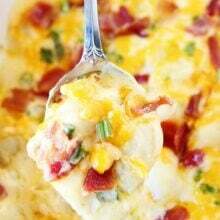 It is classic comfort food and I guarantee you will crave it on a regular basis. You just can’t beat homemade baked mac and cheese! Here are a few tips for making the best baked mac and cheese! Use large elbow macaroni, not the small elbow macaroni. You want the big guys! Cook the macaroni until al dente, about six minutes, and that is it! Don’t over cook the pasta or it will get soggy and mushy after being baked in the oven with all of the cheese sauce. Drain the macaroni and rinse with cold water. I normally don’t rinse pasta, but my dad says it is a must for baked mac and cheese to remove the starch. You don’t want the starch thickening the sauce. You will need to make a roux, but don’t be intimidated by that word, it is just a mixture of butter and flour that is used to thicken a sauce. The roux will make make a thick and silky smooth sauce sauce. Use equal parts butter and flour. Melt the butter and add the flour, whisking until smooth. Coating the flour in butter helps to prevent the flour from clumping together and making a lumpy sauce. Cook over medium-low heat, whisking frequently, for 3–5 minutes, or until bubbly and fragrant, but not burnt. Whisk the milk into the roux. Use whole milk to create a super rich and creamy sauce. You can use 2% milk, but try to avoid skim milk, you want the sauce to be velvety and thick. Don’t use pre-shredded cheese. I know it is convenient, but pre-shredded cheese contains a coating that prevents it from melting properly. Buy block cheese and use a grater or food processor to shred the cheese. What kind of cheese do you use for baked mac and cheese? For this baked mac and cheese recipe, we use cheddar, gruyere, and parmesan cheese. Triple the cheese, triple the deliciousness! Feel free to use your favorite cheeses, but this is the combo we like best. The cheddar is classic, the gruyere adds depth and creaminess, and the parmesan adds a salty, cheesy finish. Stir the shredded cheese into the sauce, reserving 1 cup of shredded cheddar cheese for the top of the mac and cheese. Stir until the cheese is melted. Gently fold the cooked macaroni noodles into the cheese sauce. Pour the mixture into a large oven-safe baking dish. Don’t skip the topping! We make a buttery panko cracker parmesan topping to go on top of the mac and cheese and it is AMAZING! It makes the mac and cheese extra special. The panko, cracker, parmesan combo is perfection! You can use saltine or Ritz crackers, both are great! Sprinkle the remaining cheese over the top of the macaroni and add the panko cracker topping. Bake the mac and cheese in a 350 degrees F oven for 30 minutes or until bubbly and the topping is golden brown. You don’t need to cover the mac and cheese with foil while baking. Let the mac and cheese rest 5 minutes before serving. The mac and cheese will keep covered in the refrigerator for up to 4 days. Reheat in the microwave. 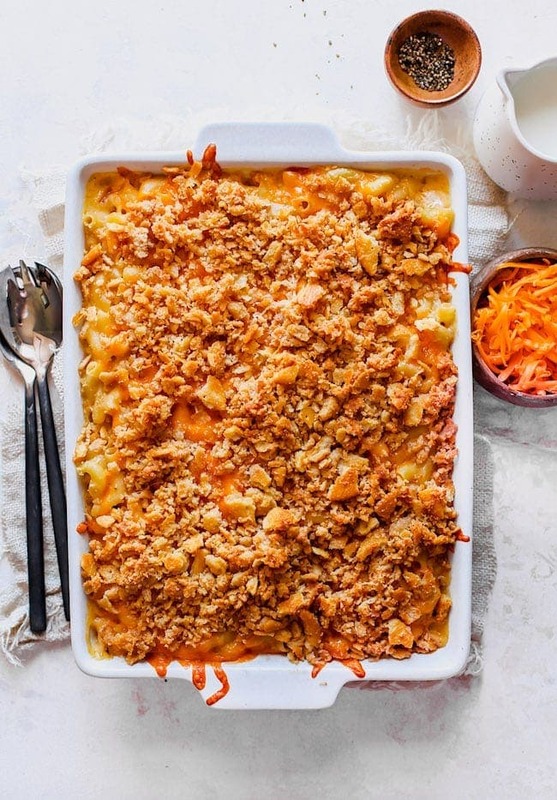 Baked mac and cheese can be served as a main dish or side dish. If you live in the South, mac and cheese is often served at Thanksgiving and other holidays. There really is no bad time to enjoy baked mac and cheese. It is always a crowd pleaser! 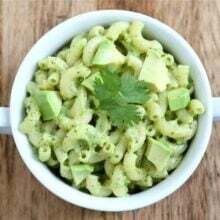 If you want to make a full meal out of mac and cheese, here are some recipes that go well with baked mac and cheese. Cook the macaroni until al dente, about 6 minutes. Don’t overcook because the pasta will finish cooking in the oven. Drain and rinse the pasta with cold water. Drain well and set aside. Meanwhile, in a large pot melt the butter over medium-low heat. Add the flour and quickly whisk. Cook for about 3 minutes, whisking frequently, or until smooth and slightly browned. Be careful not to burn the mixture. Add 1 cup of the milk and whisk until well combined and there are no lumps. Add the remaining milk and keep whisking until the mixtures starts to boil. Add the 3 cups cheddar cheese, Gruyere cheese, dry mustard, salt, and pepper and stir until cheese is melted and smooth. Gently fold the cooked macaroni into the cheese mixture. Pour evenly into the prepared pan. To make the topping, in a medium skillet, melt the butter over medium heat. Add the panko and crushed crackers and stir until the crumbs and crackers are coated in butter. Remove from heat and stir in the grated Parmesan cheese. Sprinkle the remaining cheddar cheese over the top of the macaroni and then add the panko cracker topping. Bake for 30-35 minutes or until cheese is melted and bubbly and topping is golden brown. Let the mac and cheese rest for 5 minutes before serving. A crunchy topping is a must! This looks amazing. Made this last night for dinner for my husband and some friends, was absolutely fantastic! Smooth and creamy! 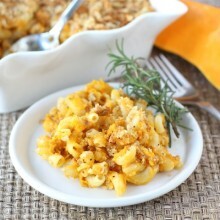 So happy you loved our baked mac and cheese recipe!